This year marks the hundredth Anniversary of the Titanic’s maiden and only voyage, yet the passing of time has done little to diminish our fascination with the “queen of the ocean” or our love of stories set upon the ill-fated ship. 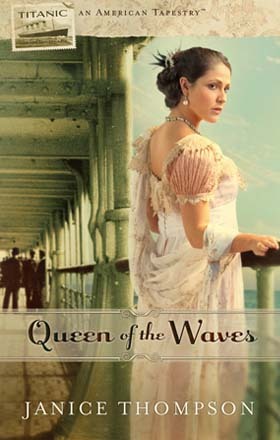 This fall Summerside Press’ new American Tapestries™ line of historical romance novels will set sail with the release of Queen of the Waves (Summerside Press/October 2012/ISBN: 978-1-60936-685-8/$12.99), a story of love and destiny by Janice Thompson. 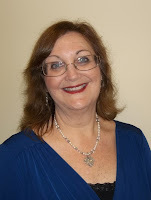 She shares more about how her latest release is different from anything she has done in the past and the unique challenges to writing about an event as historic as the sinking of the Titanic in the interview below. My agent asked me to put together a story idea focused on the Titanic. I’m usually a comedic writer, (and he happened to catch me on my way home from the theater, where I direct musicals), so I quipped: “Only if I can throw in a song and dance number involving an iceberg!” He laughed and responded with, “No, we have to play this one straight.” At first I wasn’t sure if I could come up with a serious plotline, but 24-hours later I had the story idea and the first chapter. My editors at Summerside (Rachel Meisel and Susan Downs) read the idea and loved it. When they saw me at the ACFW conference I got the news: “We’re going to publish your novel!” I was especially thrilled to hear that my book would be among the first to release in the new line. What a privilege! Q: Writing historically accurate novels take a lot of research. How much time and effort went into researching for this book? Oh my goodness! Talk about a lot of work. Not only did I spend months researching Titanic’s story (reading every available book and watching every conceivable documentary), I also drove from Houston to Branson, Missouri to go to the Titanic museum. Talk about an eye-opener! The exhibit covers everything you could imagine, and includes all sorts of artifacts from the ship. When you write about an event such as this, particularly one that has been so well documented in movies and books, you need to get your facts right. Even the “little” things (like how long did it take to load everyone onto the ship) can bog the writer down. Dozens and dozens of times I would stop writing just to look something up. And don’t even get me started on the clothing and hats! I created a board on Pinterest to study 1910 fashion! I’m not sure I realized that the Titanic made multiple stops before setting out to sea. She sailed out of Southampton, England, of course, but stopped in Cherbourg, France and Queenstown, Ireland to pick up additional passengers. Some of the best-known passengers actually boarded at the later stops. And one very famous passenger (Francis Browne) disembarked in Queenstown. He took photographs during his few hours onboard, and his photos helped document the first leg of the journey. Another thing that took me by surprise was how the second and third-class passengers were treated. After watching the infamous movie, Titanic, I felt sure the third class passengers were treated more like animals (or steerage). In reality, their living and eating conditions onboard the ship were better than most were accustomed to in their daily lives. Being on the ship was truly an adventure for all involved, (even prior to the iceberg incident, I mean). Q: The book is dedicated to your Queen of the Waves online group and (specifically) to Cathy Stenhouse Peeling. Could you tell readers a bit more about those people? As I typed the words, the idea hit: Set up a Facebook group, title it Queen of the Waves, and invite people on a “virtual” Titanic cruise. Use the name of my POV character (Tessa Bowen) as cruise director. Within ten minutes I’d established the group and posted to my primary Facebook page extending the invitation. By the end of the day more than seventy people had asked to join the cruise. We eventually reached over 200! Most of my guests chose the names of real people who traveled on the Titanic. They posted photos, comments, and much more. We utilizing networking sites like Pinterest to collect photos. What fun! And speaking of photos, you should have seen the dresses, shoes and hats my passengers wore aboard the ship. We had a delightful time shopping for our time aboard the great luxury liner. To answer your question about Cathy, she’s the great-niece of Captain Edward Smith and is an awesome, godly Facebook friend! I met her while sharing on Facebook about my story. She agreed to play the role of “captain” of our cruise, but (unfortunately) was hospitalized with a very serious illness while we were on our journey and was unable to participate. Praise God, she recovered and we remain wonderful friends! Q: Talk about your reenactment of the night the ship went down. Q: This year marked the 100th anniversary of the Titanic. Why do you think we’re still so fascinated with the so-called unsinkable ship after all this time? I would imagine that people 500 years from now will still be interested. It’s such a tragic story, and one that affected thousands of people. Meeting Cathy Peeling really put this in perspective for me. Her uncle passed away that night. This completely changed the make-up of her family. And she’s just one person out of thousands. Generations of people were affected by this tragedy. And so many feel a connection. Ship builders. Dress designers. Modern-day cruisers. The rich. The poor. The dreamers. Those who long to travel. We can all envision ourselves aboard Titanic on that fateful journey. Perhaps the greatest lesson to be learned from Titanic is this: We cannot put our trust/confidence in man-made things; only in the Lord. Q: For such a tragic moment in history, why do you think so many stories are told of finding love on the Titanic? What makes it so romantic? I think it’s the “unknown variable” that makes it all so interesting. It’s the fact that we can only speculate. Who were those people? What were they feeling? What were their hopes and dreams? What were they feeling before the ship set sail? After? How strongly did they feel it? Who did they feel it with? These are the questions that motivate us. As I sat to write this story, I envisioned people from every walk of life, all converged in one small world for a brief moment in history. Together, in that place, emotions surely ran the gamut (from exhilaration to distress and grief). Placing a love story in the middle of all of that emotion just made sense. Q: We often think of the opulence of the Titanic and how some of the world’s richest people were aboard the ship. There were also very poor passengers as well, hoping to start a new life in America. Do you know how much it would cost for a ticket? Q: Is there a spiritual thread through the story/a message that you hope readers come away with? Absolutely. Several of my characters (primarily Tessa) face their own destiny. They come to grips with the brevity and value of life. They see first-hand what’s truly important and what isn’t. In my story, Tessa learns that her picture of God has been skewed since childhood. She discovers a relationship with Him while onboard the ship, but that relationship is tested the night the ship goes down. Q: What’s next for you? Where will you be taking readers with your next book? I’m currently writing historicals for the Summerside “Belles and Whistles” line. The first book, Wedding Belles just released and the second, Sleigh Belles will release in a couple of months. These stories are more light-hearted in nature and deal with comedic women from the West. Readers can keep up with Janice Thompson by visiting janiceathompson.com, becoming a fan on Facebook or following her Twitter.